Make sure to ask for everything in your desired color-range! You might end up loving one you hadn’t thought of until you have it in hand. Exactly what I did, asking for 'dark brown' samples across a few leathers. Someone, can’t remember the user name, posted pics of his broken in A2 in seal jerky HH a while back. Jerky HH is not dyed through, it has a top coat and lighter tones underneath that will show through with wear. Looks cool! But I'm thinking I won't go the HH route because of how much I've read on here about steer being softer and having just as nice a hand. So right now I'm hoping to find some CX steer in a brown I like; if not, I might do goat. It seems it won't age as nicely as CXL, but it's more the weight I wanted anyway, and if the color's right then I think it would be the best balanced decision. Looks cool! But I'm thinking I won't go the HH route because of how much I've read on here about steer being softer and having just as nice a hand. So right now I'm hoping to find some CX steer in a brown I like; if not, I might do goat. Jerky HH is not stiff at all though, it’s quite soft and pliable. Much more so than cxl steer in my experience. The Aero goat is super nice, and I think it would be much more suited for a spring/summer jacket. Also, can I assume that goat doesn't age as nicely as CXL? Because some of the CXL aging looked simply spectacular. Chrome tanned goat doesn't age essentially and has a very light hand. Think extremely heavy lambskin that's tough as nails. I saw an 80 year old A-2 made of chrome-tanned goat that looked brand new (except for the lining...)! Vegetable tanned goat has a crisper/stiffer feel to it and wears more than it ages. Where it wears against things the surface finish will come off and give different shades of color. I think they both have their place and some of my favorite jackets are a Langlitz in brown chrome-tanned goatskin, a Goodwear M-422 in chrome-tanned goatskin, and an Aero vegetable tanned 30's halfbelt. Check out Jansolo's thread which I used for inspiration. It seems you're leaning toward CXL for your first jacket and that's a great choice. Miles different from either tanning style of goat. CXL also will fade. My black CXL already starts to show brown after one year. I personally love the jerky HH, perfect structure, strength & weight. The CXL is a densely compressed leather, lots of oil are pressed into the closely packed fibres. It heavy by mass without needing to be thick. The FQHH is actually a tad thinner than say Langlitz cow-horse-goat, but it weighs more. Huh?!? Admittedly I'm a total newb, and I realize there's all kinds of subjectivity build into these opinions, but I'm quite confused by the possibility that jerky HH might be softer than CXL steer (based on my research this week). Can you elaborate on this at all, @torfjord? Can anyone else elaborate or offer a counter-opinion? @torfjord, can you tell me more about why goat would make a better spring/summer jacket? That's what I've read, but I'm still not sure why. Is it simply that a lighter leather would hold in less heat, or something else? Handymike already answered your question about cxl steer vs jerky HH, but in short, the jerky HH is a mid weight leather and CXL steer is a heavy weight leather. It is less stiff than cxl HH, but the waxes and oils that it is packed with still makes it stiffer than most other leathers used for jackets. As for the goat, it is lighter and very easy wearing. When I wear cxl I’m always aware of the jacket because of its weight. Not so with goat, it is very comfortable and you have a great range of motion in an aero goat jacket. While leather isn’t a material that offer a lot in terms of protection from serious cold, my experience is that heavier oil-packed cxl will be harder to wear in warm weather than goat. 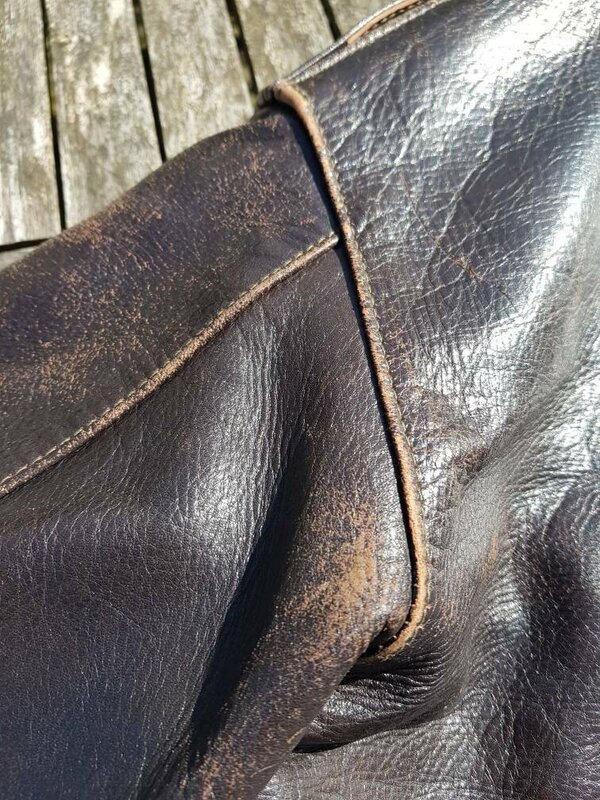 I think you’ll get more wear out of goat or another mid weight leather if you’re looking to build a summer jacket. Dbrn and El Marro like this. You need samples my friend! You hit the nail on the head when you mentioned subjectivity because every one of us has different qualities that we prize above others when it comes to our leather jackets. I think you’ve gotten a lot of good input from all of the members who posted here, but there is no substitute for getting your hands on as many samples as you can and then handling them to decide which seems best to you. Dbrn and torfjord like this. @handymike and @torfjord Thanks for the technical information, that helps a lot! @El Marro I agree! I've made the request to Holly, so hopefully I'll hear back early in the week. Can anyone tell me how Aero does the PtP, Sleeve, Shoulder and Back measurements they list on their sale jackets? I'm trying to use a corduroy jacket I have to compare, but I'm not sure exactly where to start and stop measuring, when to go straight across or curve, etc., and I can't find any guides on the Aero site or by googling. Sleeve: measure from the shoulder seam straight down to the end of the cuff. Do not curve around the arm, but go straight down. Shoulder: measure straight across between the shoulder seams. Back: measure from the collar seam (i.e. don't include the collar when you measure) straight down to the end of the hem. Perfect, thanks torfjord, just what I was hoping for!